Get on the road again, courtesy of Lucid Games. Lucid Games may not be the most recognized name in mobile development, but you can expect it to make an impact later this year with 2K Drive. 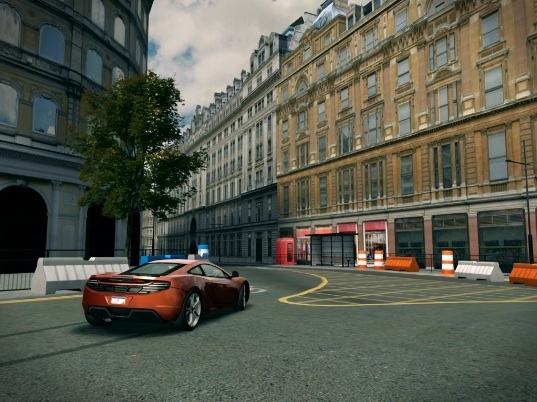 The team mostly consists of people from Bizarre Concepts, the same company behind the Project Gotham Racing franchise and Activision's Blur - so they know a thing or two about virtual driving. Don't expect a quick thrill with 2K Drive, though. Lucid set out to create the ultimate driving sim, divided into three main components - Championship, quick events and multiplayer. With Championship, you race for glory. Each race gives you a certain number of stars to earn, and also rewards you depending on how you perform, similar to the Kudos system from Project Gotham. Earning stars unlocks additional content, along with opportunities to get cooler vehicles. That said, you'll pay to download 2K Drive, and there are in-app purchases to acquire high-end cars. Quick race events challenge you to complete individual runs, but there's a little more variety when it comes to these competitions, including off-road challenges and mini-games, including soccer. Unfortunately, this wasn't available for the hands-on demo. Finally, there's multiplayer, where you can challenge people directly online to a race or complete for the best times. There are individual challenges with each event, such as nailing the best lap time or getting first place, so it's important to stay focused. There's plenty more to 2K Drive, starting with the driving community. The app features an in-game hub, where you can check on the latest automotive news gathered from a high number of sources. It's a good way to keep track of what's happening in the real world. When it comes to gameplay, 2K Drive will have a couple of different options available, including touchscreen steering and tilt controls. We managed to experience the latter and it felt natural, as the car responded quite well to the accelerometer function; gas and brake are on the right and left sides of the screen, respectively. We still need to get the hang of drifting - we crashed into walls a couple of times - but it's a solid control system, one that'll grow on you. As for the presentation, it's right up there with the best iOS racing games. The car models look gorgeous, the racing action runs smoothly and the two tracks we saw offered a variety of challenging turns and details that stand out. We still have a lot to uncover with 2K Drive, but so far so good. After our test drive, we can't wait to see how much further the road takes us. 2K Drive releases later this year for iOS devices.